The globalists are on their way out of the White House, further diminishing the voices close to President Trump that say humans are warming the planet. Departures of key personnel have left an energy and environment policy vacuum that many within the White House expect to be filled by nationalist advisers. More exits are likely on the way. The resignation of National Economic Council Director Gary Cohn, announced yesterday at a White House meeting, was the latest blow to those who remain hopeful for climate policy. His departure is seen as a potential dam break, with other aides likely following his path. The former Goldman Sachs Group Inc. executive supported remaining in the Paris climate accord and convened conversations with carbon tax advocates. "I think you'll see good people leaving from the White House," said a White House official. "I think that their departure dates, which were sometime in the future, are going to be dramatically sped up." Peter Navarro, Trump's trade adviser, is seen by some as likely to make a play for Cohn's job. Navarro, known as a nationalist voice in the administration, has curried favor with the president for his defense of tariffs on steel and aluminum that have engendered widespread backlash globally and within the GOP. Cohn opposed the tariffs, which Trump is expected to formally propose any day. The White House said Cohn would still remain on staff for a few more weeks, even as Trump begins to look for his replacement. "Will be making a decision soon on the appointment of a new Chief Economic Advisor," Trump tweeted last night. "Many people wanting the job — will choose wisely!" The NEC had already been weathering turmoil. George David Banks left last month after failing to get a permanent security clearance. He handled international energy issues and was viewed as a top voice pushing for re-engagement in the Paris climate accord. That, combined with Cohn's exit, weakens the prospects that the United States will remain in the global agreement. Trump has said he'll pull out of the Paris pact, but he can't formally do that until November 2020. "One thing is for certain, the pro-Paris crowd has certainly been dealt a setback these past few weeks," said Tom Pyle, president of the Institute for Energy Research. In fact, several NEC advisers have already headed for the gates. Jeremy Katz, an economic adviser and one of Cohn's top allies, left earlier this year. Grace Koh, who oversaw technology, telecommunications and cybersecurity, announced she was leaving last month. Beyond that, other changes in the energy and environment staff loom large. 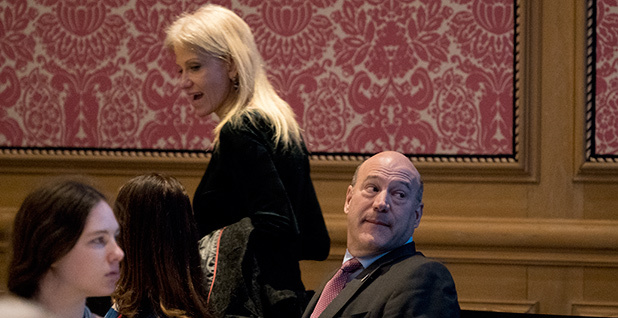 Everett Eissenstat, the council's deputy director, who assisted on energy and environment discussions at the Group of 20 summit in Germany, is Cohn's lieutenant on trade. He was on the losing side of the tariff decision. Mike Catanzaro, who leads the energy and environment portfolio, could also be affected by Cohn's absence. "I imagine that many of the people who worked for him have been preparing their exit for a while," said Mike McKenna, an energy lobbyist who is largely supportive of Trump's policies. "I'd be surprised if there weren't more announcements in the next 30 days or so." One industry lobbyist close to the administration described Cohn as a leader inside a "pressure cooker." That person said, "I wouldn't be surprised if we see additional folks leave in the somewhat near term." However, the lobbyist added, "domestic policy advisers are somewhat siloed in the White House. So those working on energy and the environment will not necessarily follow Cohn's lead, nor are they likely to be fired." Departures could erode the contingent of White House aides with energy and environment experience. Given the administration's broader challenges around staffing key positions, those spots could remain vacant for the time being. If they do get filled, it's unclear whether new advisers would view the Paris accord and other climate issues favorably. That view is on the wane in the White House, and the credibility of those who remain is being tested. Jared Kushner, Trump's son-in-law and adviser, has been dogged by accusations of mingling personal business and political affairs, and it's been widely expected for months that Secretary of State Rex Tillerson is on the way out. Still, Cohn's presence never made a significant difference in the trajectory of environmental policy under Trump, said Ben Beachy, director of the Sierra Club's responsible trade program. Although Cohn was a registered Democrat — a fact his detractors who opposed climate action often raised — Beachy noted that he was also influenced by his roots in investment banking. "It's still a Cabinet decked out, unfortunately, with corporate polluters," Beachy said. "The guy also was clearly a champion of the Goldman Sachs view of the world." The industry lobbyist expressed hope that Trump will replace Cohn with a "voice of moderation." "I don't think that's a promotion from within," the lobbyist said. "More likely, the president will try to recruit another adviser from the business community."